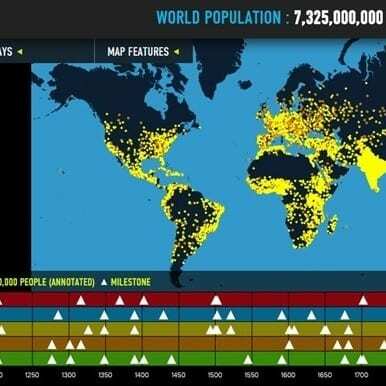 The cornerstone of World Population History is an interactive map of the world, where dots represent human population (one dot = one million people). At any time between 1 CE and 2050, you can zoom in on the map and click on individual dots to learn more about the population of that area. Turn on any number of map overlays to see how fertility rates, carbon emissions, land cover, and life expectancy have changed around the world as population increased. A historic timeline accompanies the map, offering context to the population numbers indicated on the map. Milestones relating to food, technology, people and society, health, and the environment inform about events, inventions, and social movements that have impacted human numbers over time. Four contextual readings and six classroom lessons plans are available to help teachers utilize the site in the classroom. These detailed, teacher-friendly lessons incorporate a variety of the site’s features as well as hands-on simulations that are sure to be meaningful and memorable. Visit World Population History now! The Carbon Crunch (pdf): Students work in small groups to determine the main environmenal concerns during given periods of history and analyze how carbon use specifically has changed over time. Students then participate in a comparison activity to determine how countries differ in terms of amount of carbon emitted and vulnerability to climate-related risks. Where Do We Grow From Here (pdf): Students explore and discuss the UN’s population projections to learn how small changes in the fertility rate can produce significantly different results in terms of total population. Students the model population growth projections from 1800 to 2100 to see where in the world population growth has and will occur. Finally, students explore challenges to population stabilization in areas of high growth and research organizations with successful strategies for addressing these challenges.